Riding to Howard SD, Following the Ancient Dakota Highway. “Wasicu” the Dakota word literally means, one-who-takes-the-fat. (Wasi=fat, cu=one who takes) Peter explained to me that first contact between the Europeans and Dakoka occurred at a time when the explorers/trappers where starving. The hungery invaders would sneak into Dakota camps and cut off fat from the drying buffalo meat. Many people today know it is the word for white-man, few know the etymology. However the word became more than appropriate as the immigrant hoards again and again took the fat of the land. The road we have been traveling, SD highway 34, was an ancient passageway from Minnesota, across the Missouri, and into the Black Hills, frequently traveled by Lakota, Nakota, and Dakota bands. Now we travel the road east from what became a prison camp and later the reservation to where most of the Dakota were banished after the war of 1862. Many of the riders from Crow Creek have relatives who tried to get back to MN after the prison-camp era ended. They too followed this trail while trying to escape being hunted and killed by bounty hunters. Today, to ride as fast a possible, we ran relays. With 40 miles to cover, a fresh group of 4-8 would head out for a hard 5 miles, there another group would take the staff and launch out for the next 5 miles. 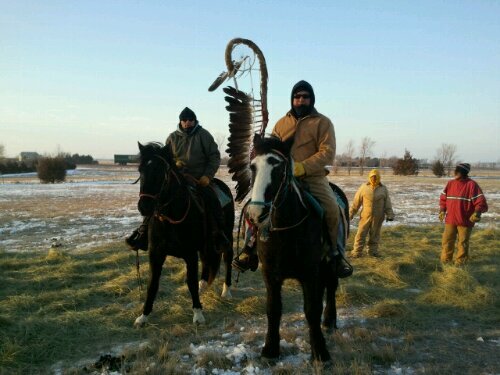 As I’ve had the honor to be one of the riders following the staff with 40 eagle feathers (for the Dakota 38 +2) I ponder the significance. Riding with those whose ancestors were hung, exiled, hunted, and hated, while my ancestors received the “Wasi” of the land. Almost all of my 8 great-grandparents were the settlers who moved into Iowa and Nebraska immediately after the Native people were forcefully removed, and in ways not all, that different from the Minnesota story. As I shared with one of my new friends today; Perhaps if we can ride in peace together today, while also symbolically and spiritually riding for our ancestors, healing can begin from wounds inflicted long ago.